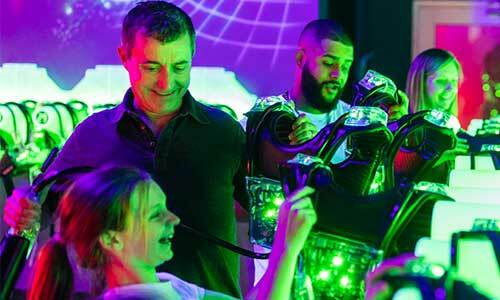 Experience Live Action Laser Tag! XtremeCraze's LASER TAG is a fast-paced high-tech game, which combines the games of hide and seek, tag and capture the flag, incorporating state-of-the-art interactive computer and laser technology to create an exhilarating experience you won't forget. 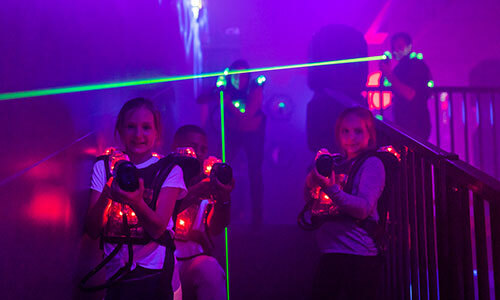 Our laser tag arenas feature the largest next-generation multi-level laser tag arena and are among the largest in the United States. And our LED lighting enhanced multi level huge 7,000+ square feet Laser Tag arena shows that XtremeCraze has the largest playing areas in New England. The game is played in a multi-level futuristic arena filled with glowing pillars, arches, passageways and swirling fog. Players, whether individually or on teams, use their lasers to score as many points as possible by targeting opponents' vest sensors or attempting to overtake the opponents' base stations. Individual scores are tracked in real time and are displayed on each players vest and on monitors throughout the arena. The team with the highest total score wins. Perfect for birthday parties, corporate groups, team and social outings, or simply for those with a competitive spirit to engage in some heart pounding fun. 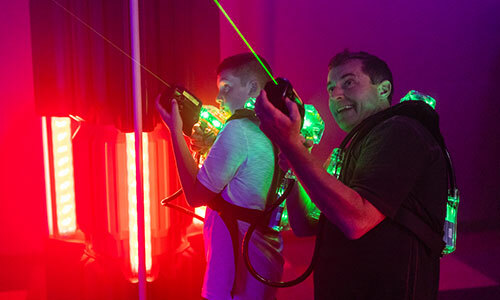 XtremeCraze laser tag is designed for kids as young as seven years old to grown-ups of all ages. We can accomodate groups of persons with disabilities for multi-player games, with games being blocked off for special request groups. Please call ahead. The contact surfaces in our XtremeCraze facility have been sanitized by Swisher Hygiene using a safe, hospital-grade germicide to eliminate 99.9% of most common germs. Come Play Laser Tag At XtremeCraze! P.S. Reservations are not required but are strongly recommended! 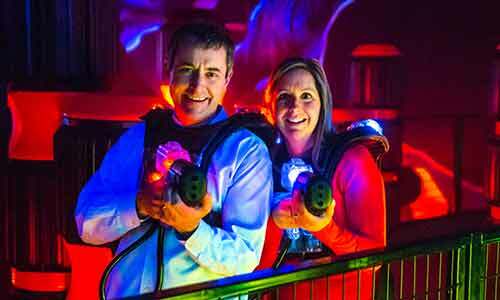 LASERTRON, manufacturer of professional laser tag equipment and arenas.